Kaleidoscope is The Premier bar in the Los Angeles hedge, An ever changing venue found in the downtown areas hedge. The only way to gain entrance is to know the key of spitting on the floor in front of the especially piss and vomit stained wall and saying 'so a black guy goes into a bar…', This makes the wall vanish for 10 seconds showing a grungy alley that leads into a private garden type environment that thrives regardless of the lack of sun or hygiene. The building in the center of this garden is Kaleidoscope, made from hundred of colors of bricks, windows that are tinted in colors that never quite stay the same or in summer even intact. The large double doors are constantly guarded by some imposing goblin or another that never quite seems to move. Many people expect Kaleidoscope to be calm like how the market is supposed to be or how the courts dignity claims its like. 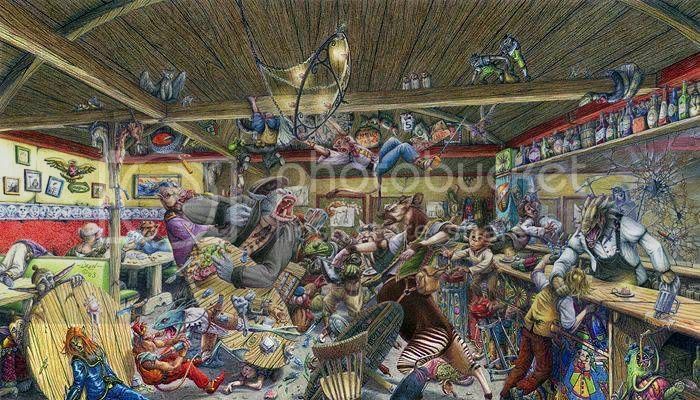 In reality the bar is loud, smoky and full of the smells of dusty glass, Alcohol in thousands of varieties, and the collected scent of mantles clashing, musk and whatever other smells that goblins, changelings and the animals brought from the hedge bring in. This is the general way the place seems though, it changes… oh does it change. When the solstice comes around its an honored tradition that whatever force keeps the place in business changes with the season. New workers, New drinks, new food. Everything must go the day before the solstice creating a huge party environment that sometimes even attracts the monarchs themselves. There is no carding at Kaleidoscope or even a common currency, the small troup of bartenders end up bartering with every customer, the barmaids will ante for tips or payment, and the entertainers drink in the glamour. If you can pay your account though then the jaw dropping alcohol selection would make an irishmen cry. Theres no such thing as a safe Hedge drink and kaleidoscope doesnt truck with the weak tapwater of the real world. Everything in the bar is either brewed or found directly in the hedge and traded right to the bar, in fact trades of booze are a common value that the bartenders prefer. In Spring the bar is all glass, plants and flowers. The favored drinks become goblin wines and champagne. Its a party every day if the waitresses can help it. Sometimes its exotic dancers on poles and stages that werent there the day before, other days its standoffish sylphs that leave narcotic flowers growing from your table. When spring comes around the place is bright and happy as much as it can be and no public room is made private with the entire place being a community. Summer is a mexican stand off waiting to happen The tables are easily disposed of and all the drinks are the hardest nastiest things you could have that show whos the men and whos the boys. Fights becomes so common in summer that the pit is uncovered and blood sports become the entertainment of the day and duels the contests of the night. The bartenders become armed brutes and the barmaids wear leather and lose the normal soft attitude. You dont want to pay…well whos to say the blood broth wont be made of you tommorow? Sugars, heavy syrups and a lack of radiant light is the tone of spring, The chairs and tables are made of gnarled wood and all the lighting is candles and glowing beetles. The drinks of choice become hot ciders, and the fermented lost hope of ghosts. The Barmaids are all shadowy wraiths who drop your trays on the table and vanish, The bartenders hooded men with voices like bone rattles. Fights are not welcomed during the fall months and gambling becomes a much more common situation with games of chance taking the place of brawls, and woe to anyone who gets snake eyes in this place. Ice…everywhere…its all ice in winter. the chairs are ice that doesnt seem all that cold, the tables could keep your drink cold but for some reason dont seem to bother your arm, all the glasses are made of ice that doesnt seem to melt. The normal winter drinks are on display, eggnog, hot cocoe, hell even mulled wine but none of it is normal. The wine might be spiced by those lost childhood dreams of santa, the marshmallows could be that coal you should have gotten growing up after its stayed in the vats in the back. The main drink of winter though is Revjik, Distilled from hedge ice and the blood of an kind of hedge beast thats made of ice and fear. The place feels like an oil town during the closing months, with pan steel over the windows and a quiet nature that begs you to shut up most of the time. Chinchu - a large bug that leaks a fermented sugar out its back you drink it right from the source which happens to be something like a heavy chitin bowl. Warming and sweet with a feeling that leaves you feeling itchy like bugs are crawling on you. gold rum - made from actual gold. Melted to perfection and served right to you. Heady solid taste that stays with you for hours. knock it back fast before it cools. golden scythe black - battlefield spirit maintains a chill even in direct sunlight, which it appears to absorb. Optimal serving is by the drop. Contact with exposed flesh is discouraged, but likely inevitable. Made from hedge grass and blackroot fermented in lost hopes then sprinkled with licorice.